Want to improve your French? We’ve got the perfect solution! Find a Partner - It's free! If English is your native tongue and you live anywhere in the world, and you’re interested in learning French, then why not partner up with a French person for reciprocal language learning? This offers you the opportunity of learning more about French culture and language, whilst getting to know a French native speaker. Thanks to our reciprocal language learning program, you can be sure that your language partner is motivated by language and cultural exchange. Their objective, like yours, is to improve their language acquisition through practice. By regularly speaking to a native speaker, you will be producing language and this is the best way to learn. By speaking regularly to a French person the language will come alive. It will be like traveling to France without getting up from your sofa. If you like the French culture and way of life, and have already studied French, or if you are currently learning French, or even if you are a beginner starting to learn French, the Language Partners program is a wonderful program for you. Thanks to the French American Center, you can be sure that you are connecting with a French person who is already a member of this well-established, non-profit association based in the South of France. It’s totally safe because we meet each person, have all the details of their identity, and vet them personally to make sure of their suitability for this language program. Our program is completely free for native English speakers. You simply have to sign up online. You can use Skype, WhatsApp, or Google Hangouts in order to exchange with your French language exchange partner. So you can really learn French and speak French and enjoy French conversation from the safety of your own home and without getting on a plane!!! Whilst spontaneity makes for a fun conversation, reciprocal language learning can be optimised by preparing a little before you speak to your partner. Working on the idea of concentric circles will mean that you get to know each-other and reinforce your day to day language before taking on the more complex discussion subjects. So start by talking about yourself, your family, your daily routine and the objects and places around you. Start describing in more detail.Ask and answer questions. That’s the first few circles covered. Then we can move further out. Your city, your district, your country, your culture, history, literature and culture which you want to share. Week after week you will become more knowledgable about French culture and your partner’s views, and in turn they will learn about you and yours. Showing pictures or sending links for further reading online can illustrate your point. Reciprocal language learning – how does it work? If you learned French at school and just enjoy all things French, or if you have lived in France at some point and want to keep up your language. Practicing with a native speaker can help you a lot! Native speakers give you so much more than any text book or application, they have the inside knowledge of what’s going on NOW with the language and the culture and they can help you feel connected even if you are far away. Our language Partner program offers you the opportunity to chat with a native English speaker. This is not a class, so you are free to talk about whatever interests you without grades or homework! Practicing with a native English speaker who is NOT a teacher will give you the chance to adapt to different accents and real conversation styles. Not only will you learn conversational skills, you will also be able to learn about your partner’s culture. Meet as often as you like and at a time that works for you and your partner. The idea of reciprocal exchange is based on generosity, sharing and giving. It starts off from a positive point. It’s an open and tolerant exchange where there are zero expectations about performance and where you are in a mutually trusting and rewarding situation where you will feel at ease and build confidence. Scientists and language specialists* have proven through research that the best way to learn a new language is to practice having conversations, listening and reading in a situation where you understand the main message. So if you understand the meaning then you are learning. You do not have to understand or translate each word in order to learn. You do not have to understand and study the grammar of each sentence in order to learn. You do not have to really do anything at all in order to learn. You just need to understand the general message, let it wash over you, and see what sinks in! (* See Krashen’s theory of comprehensible input). Little by little the new words you hear or read will be acquired. They will sink into your brain! Furthermore, if you feel relaxed and happy in the situation where you are exposed to language, then you will learn more. If you are anxious or unconfident, you will learn less. If you forget that you are conversing in a foreign language, because you just ‘let go’ and get interested in the subject, then you will really learn the most! With the ‘affective filter theory’* specialists show that anxiety actually blocks or filters out, the new language so that it cannot be acquired by the brain. So all in all, you need to focus on the message in a relaxed way and enjoy the experience. As Stephen Krashen said “We all acquire language in the same way… when we understand messages.” So sit back, relax and enjoy the ride! In another hypothesis *researchers found that interaction was the best way to optimise input. They found that face to face communication contributes to language development (See *Michael Long’s interaction hypothesis) and that the most new language is learned when learners have to ‘negotiate for meaning’. When the learners have to ask someone to repeat or to re-phrase, or when they don’t understand and have to paraphrase or ask for clarification, they learn the most. When their interlocutor repeats things, or says them more slowly, learners have more time to process the information. This is why it’s easier for them to learn new words when ‘negotiating for meaning’. So, if don’t be afraid to ask someone for clarification! It’s a great way to learn. So, if you enjoy experiences where you are using French, and you don’t hesitate to ask for clarification, you already have a better chance of learning quickly. The icing on the cake is to practice producing French language. To try and make yourself understood. Producing language is part of the process of second language learning (see *Merrill Swain’s output hypothesis). According to the output hypothesis, the moment a learner notices that they are short of a word or expression is very important. When the learner then tests a word, they will learn by ‘trial and error’. This trying out of words is one of the best ways of internalizing and processing linguistic knowledge. There is a well-known proverb which says: If at first you don’t succeed,try, try, try again.’ So in fact making mistakes is an excellent way of learning. Improving your French is all about input, output and interaction. It’s the hokey pokey of language learning! You can see how practicing with a trusted partner who you feel totally at ease with can really help you to improve your spoken French! 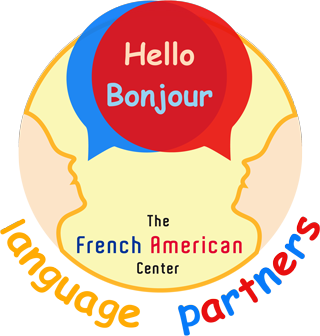 We are The French American Center, established in Montpellier in 1991, set up by Jérôme Henri Rudes and still run today by Jeanette Franklin. Our Current President is David Hill. Our aim as a non-profit association since 1991 continues to be to provide cultural exchange opportunities for the members of our association to learn more about English-speaking people and cultures. Here in our center we organise events, discussions, exhibitions, parties and exchange programmes. Through cultural and language exchange we hope to build bridged and broaden horizons. We also organise guided language exchange stays which you can learn more about here. For more information, please email events@frenchamericancenter.com. You can also reach us by phone at +33.4.67.92.30.66. We are based in the beautiful city of Montpellier, on the Mediterranean coast in the South of France. With a population of 275,000, Montpellier has all the perks of a big city but thanks to the pedestrian historical center, it also has the quaint mediaeval charm of larger village. Museums, galleries, organised hikes through the surrounding hills and vineyards, underground rock concerts, dance clubs, cozy jazz nights, trivia nights in the Irish Taverns, salsa nights at the clubs, gorgeous cathedrals and churches, and conventions. Montpellier hosts a number of outdoor events throughout the year notably, the Christmas light show, outdoor market and the August wine tastings. The modern tram system gets you around the city or out of it in just minutes to the Sud de France Arena to see shows like ; Cirque de Soleil, Katy Perry, and Beyoncé, the French Open, Hand Ball and so much more. The beach is just 15 minutes away where there’s just as much to do during the day as there is to do at night. Dining and dancing on the shores of the mediterranean ! Once you sign up, you will be interviewed by Skype by the French American Center team, who will also verify their identity. You will be asked to provide proof of your postal address to our agent so that we know you are a real person:-). All of your personal details are kept safe and are not disclosed to other members of the French American Center or to any third party. Partners can only contact you through the Skype ID or Messenger ID that you wish to use. All our sites are secure and we will never share your personal information with a third party or with anyone else. We know all the people who are your language partners and we have also interviewed them face to face as well as asking for identity proof. So this is not just a random encounter, it is a safe service provided by an established not for profit with the aim of offering cultural and linguistic exchange opportunities only. Please make sure that you only ever discuss proper and decent subjects with your partner. Never talk about intimate things or share intimate images. Please avoid subjects such as politics and religion so that you can avoid offending anyone unintentionally.